After hearing the introduction given by Sandheep, most of the audience here must have started assuming that I am going to deliver a humorous speech which will tickle your funny bone – Seriously guys, I am not sure which bone is that. And I assumed the same when I filled in my name in the docs that Sandheep shared with us. Once there was a argument between a Mathematician, Geologist and a Scientist on proving that the Earth is square in shape. The Scientist used all the symbols that he knew- Alpha, Beta, Gamma, Rita and he finally concluded that Earth can never be a Square. The Geologist took a Globe and examined it closely – It was very similar to our Toastmasters International Logo. After thorough examination, he concluded that the Earth can be a rectangle but not a Square in Shape. Now it was the turn of the Mathematician. He concluded in a single sentence. I have always assumed that I was good in Assumptions. My relationship with assumptions dates back to 1995 when I was in my First Standard. Now I am going to directly get into the topic here. No describing the sky, no describing the school or my uniform or about how tall i was back then – No – We are getting into the details directly – I saw a girl. She was pretty, her hair neatly double plaited – She was the perfect girl every First Standard Boy would dream about. She was refulgent. Her name starts with Ka and ends with Ri. And it is the name of a River. Any Guesses? See I always tell my mom – The reason I go to Toastmasters is that the Hall is filled with intelligent people. Once again you have proved me right. But then it struck me. She had a normal set of eyes like everyone. I assumed she had this problem. My second encounter with the Assumption was when i was in my third grade. I used to play a lot of cricket back then and every boy would have a friend who hits every ball that you bowl out of the house. In my case it was Godwin. My neighbors were very kind. They always kept the doors open and you can practically go into the house and take whatever you want. When i picked up the ball, I saw a man painting a hen. He was giving final touches to his master piece. The Hen was so cute and he had exhibited wonderful artistic skills. I always wanted to learn painting and I thought this person will be the one who will help me discover my inherent skills as an Artist. Next day, I went with my dad with a long size drawing note – To my surprise the person who was wielding the paint brush yesterday was having a long knife cutting chickens – He was no artist – He was a Butcher. Do i even have to tell you that i came back home upset. 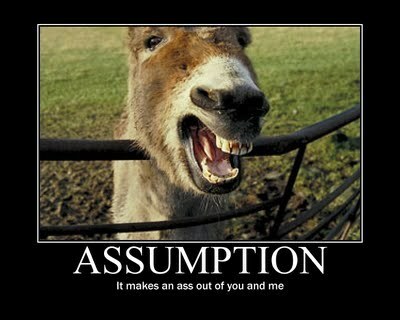 The best thing about assumptions is that it is very easy to make one. It does not take a lot of efforts. You can assume anywhere-anytime. I had always assumed that i was a great speaker until one day the person sitting next to me ” This was the best thing I had ever done ” . And he said that immediately after i took my seat after a long speech. The last time I dealt with Assumptions was in the Last Week. I had assumed that i would close a good deal, like any person in the Business Development who normally does and I had challenged my Boss on the same. But unfortunately I was not able to seal the deal and again it is like any person in the Business Development normally experiences. Here again I have assumed something that has not happened. So Toastmasters, whenever you try to assume something, Try to remember about my experiences with Kaveri or the Painter Butcher or your recently screwed up assumption.